That’s ‘get it done’ in English…hehe. They talk funny here in Atlanta, I guess I sound funny to them too, being from Chicago and the Philippines. But runners—especially slow runners—are the same all over: They have same anxiety when starting a race. But beyond the Southern accent, they are nice out here. This is my first time to run outside of my home city. I am glad I did it here and in a small race to fully experience Georgia’s southern hospitality. The Silver Comet race was named after the trail the half-marathon was run on. It is flat and is beautifully set in tree-lined pathways big enough for the 1500 participants. Being small the crowds were limited except at the end. Race rules says no iPods or earphones in-use but nobody would call you out. That would not be nice. They have their own version of timers too. At each major mile marker, they have volunteers standing and shouting out your time as you pass-by. “Seventy minutes. Ten seconds,” shouted a volunteer at mile 6, then he counts for the next runner. The water stations were adequate and they have bins to dispose of your cups. Runners would take time to throw it properly in designated trash bins or piles. I told you they are nice here. Nice but still competitive. The male winner came in at 1:18:01, while the female winner 1:26:36. I came in at 2:37:48 which is a good improvement from my last half-marathon of 2:43:56 (bye-bye, Al Roker) in August. I got it done. Also, I am happy with my time and felt much stronger in the second half. Stronger but still vulnerable. When you think about it, my predicament is unbelievable, unreal, and unfair. I have confirmed cancer nodules in the very lungs (both lungs) that keeps me running. I have improved my time by six minutes in the half, finished a marathon three weeks ago, and I am not wheezing or coughing. As if my cancer is not real and yet I have to give this all up for chemo in two weeks. I am not bitter. I know what this disease can do and I am not taking it for granted. I take what is given; like the opportunity to run here in the Atlanta area or be with friends. Besides, it is best to deal with my cancer when I am my strongest and the nodules are still relatively small and few. Now for the finale, my wife and I are entered to run the Hot Chocolate 15/5K race on November 5. What a better way to close my running season than eating some decadent Ghirardelli chocolate at the end of race. Yes! My cancer cells will be so happy with first class chocolates to plump them up. It will be a sugar-loading feast for them until November 8. Ha…ha…ha! Happy Halloween. n my mind I thought I escaped by leaving for Atlanta, but in the end I think it was just taking a detour to the same destination: chemo treatment. The results of the CT scan still bothered me so I called up Dr. B, the radiologist who read my July 28 PET scan. I had gotten to know Dr. B when he did my chemoembolization(or targetted chemo) December 2009 (see related post ‘At the starting line with Dr B‘). He is a very warm and caring doctor who is thorough with his work. He said he was disappointed when he saw my July 28 PET scan showing the suspicious nodules in my lungs. I told him the reason for my call. “Dr. B, can you tell me which of six nodules discovered last July 28 grew when compared to the October 20 CT scan? The October 20 report just said ‘representative nodule’ measures 1 cm,” I asked nervously. Each time he gave me the comparative results, it felt like a stab to my heart. Breathe. I lost count. It was like pounding nails sealing my faith, forcing me to accept reality: it is back. “It is conclusive, Bo.” He solemnly said. I thank him for his openness. Also, he does not think another PET scan will be helpful. He just advised me to have a discussion with Dr. M on my treatment plan. It is back to chemo for me. It is like, I am being told to go back to the back of the line because you have not learned. I maybe missing the point of this lesson this time or it maybe just hard to see it at the moment. Do you get it? What my muscle memory tells me is just to stand up, move, and never give up until I finish this challenge. But chemo treatments are not marathon races. They are unique by itself. There are no endorphin highs or no medals to show. There are even no winners or finishers, just survivors. In the end, there are just those who are with us or those who are not. I will commit myself to this again. What else is there to do. I will be at the starting line again on November 8. Please come with me again. P.S. 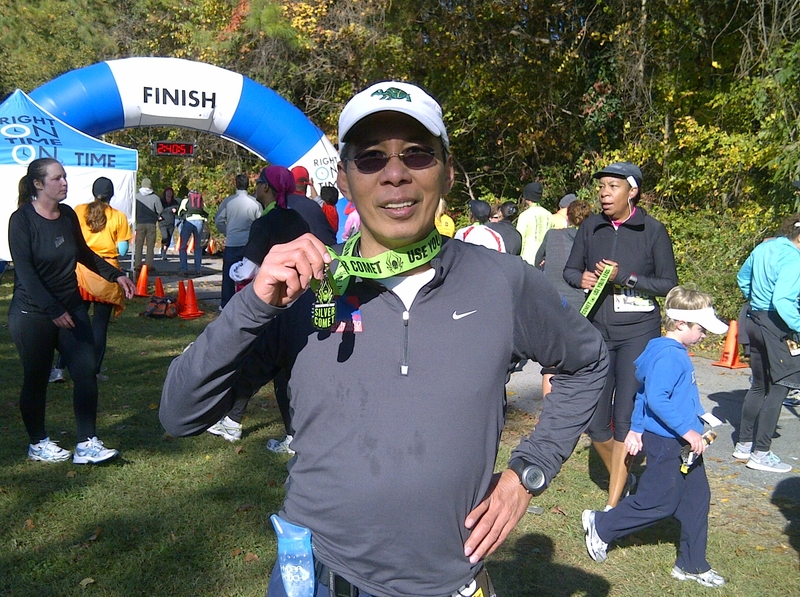 I entered a half-marathon race this Saturday, October 29, here in Atlanta. It is called the Silver Comet. Let’s see what they have here in Atlanta besides peaches. y a millimeter. How can a millimeter change your life? That’s cancer for you. I think I was prepared to hear the news but I still hesitated. I had been conditioning myself for the imminent news. Yesterday morning I had my scan and in the afternoon, my daughter, Abby, had a scheduled MRI so I accompanied her. While she went for her scan I went to see if the results of my CT scan are out. It was already done. The technician gave them to me but I did not dare open or read it. I think I was trying to delay the inevitable. It is not like I am going to prison but the thought of not knowing gave me sense of freedom. After a while, I called my wife. She was sleeping since was going to work later that evening. “I have the results, babes.” I said. “What did it say? Are you with Dr. M?” She replied after being fully awake and asking a flurry of questions. She is anxious as I am, I guess. I read through the report while she listens. ‘…there are multiple pulmonary nodules in both lungs. A representative nodule in the left upper lobe measures 1 cm…‘ There’s the change. I read through the rest which tells no metatastic malignancy activity in the abdomen or pelvic area. I got resected organs here and there due to cancer surgeries but all in all, it was clean. But in the chest area, multiple bilateral (both lobes) pulmonary nodules, suspicious for pulmonary metastases was the impression. There was silence for a moment, then I told her I will hang up and see Dr. M, my oncologist who is still in the hospital. Dr. M studies the July 28 PET scan and the latest CT scan. 1 mm difference. He calls his colleague, Dr. R to get an opinion. Both leans toward more chemo but would like to run one more test: another PET scan to gauge how aggressive the chemo they will have to give me. Ah…my world is shrinking again. I hate this. The idea of more medicinal poison just puts a bad taste in my mouth. For the third time I am going to chemo jail. We can rationalize everything but I will be kicking and screaming until that first drop of chemo hits my vein. I told them I am committed for the next two weeks and I leave Sunday on business. I ask if we can delay the procedure. They agreed. 1 mm. A fruit fly is small than a millimeter and I can crush it with a finger. However, this cancer is on its third year of scalpel fighting, targeted-chemoembolization shootout, napalm- carpet-bombing chemo war with no end in sight. The battlefield is littered with good cells and cancer cells, of vomits, constipated stools, falling hair, sweats stains, and more. Damn this cancer. And there is the collateral damage of lost time with family, less running, and financial stress. I hate cancer. Let me just say this, that’s the last 1 mm you will take from me, my family, and my friends. Capiche. Oh, did I tell you I have a brother named Guido? This Kenyan has Italian blood too. P.S. Thanks for all the positive vibes and greetings. Facing reality: Lung CT scan. short posting. My oncologist’s office called to say that I have been schedule for my chest and abdomen CT scan Thursday morning, October 20. Gulp. We will now find out if the six nodules in my lungs has grown or multiplied when compared to my last July 28 PET scan (see related posts ‘Its not there‘ and ‘The plan‘). All bets are in. Should there be any cancer activity, I am sure the verdict will be six-months of hard chemo. I am hopeful, and praying for the best. My blood test last week showed my CEA (tumor count) level is stable at 1.7, which is under the 2.5 threshold. “Be sure to pickup the barium sulfate contrast so you can drink it the night before.” I was instructed. Great. Just in time for Halloween, I am my own ‘glow in the dark’. t was a blur. That is how most people would describe a big marathon event. It is an overload to your senses. 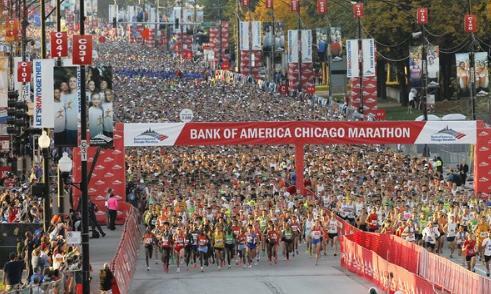 With 45,000 registered runners and an expected 1.5 million spectators lining the course, you are the star of the show. The corrals are packed, music is blaring, photographers in the corral, GPS chirping, and the smell of bengay in the air. Huh? The crowd pauses as Star Spangle Banner anthem is played and at the end a crescendo of cheers moving from the front of the line all the way back. Chills run up my spine. Then you hear the honk for the start. Runners try to surge forward but is held at bay by corral marshals. It is like holding off wild horses. As we move forward, you step on piles of clothes left behind (not much compared to last year). It is a practice to wear your ugly sweater and sweats at the start to keep warm and toss them just prior to the start. I see the starting line now. I did a last minute check to reset my GPS. Let’s go!!! We (my wife, Elizabeth, and I) decided to hang with the 5:45 run/walk pace group. The target of the group is to finish in 5 hours and 45 minutes by running for five minutes at 12 minutes/mile pace, then walking for one minute. Sounds doable right? We crossed the starting line and the initial rush comes. The crowd is thick. I check my ankle and pray it holds up for the next 26.2 miles. Our group, of about 50, holds back and I concentrate on the runners in front of me to avoid accidents. The key is to hold back the adrenalin rush and avoid running fast. Lots of energy is wasted at the start so it can be challenge. This is not a sprint, I tell myself. Our group waddle through the first few miles with runners passing us. Suckers! At La Salle St. (Chicago’s version of Wall Street), the ‘Occupy Wall Street’ demonstrators are in full force. Their chants echo against the concrete building and tries to to drown out the spirited cheers of spectators. We keep a steady pace; run for five minutes and walk for a minute. Slowly, we start catching up to some of the runners. Close to mile marker 8, Elizabeth’s family greeted us with my godchild, Miranda. Woohoo. The area is Lakeview, a haven for the gay and lesbian community. They always put on a show. There is the usual rifle-wielding gay dancers twirling their wooden rifles like a baton. You go girls…er, I mean guys. Some cheerleaders in drag and cowboy line dancers. I love it. At mile maker 10, Elvis is on deck. “Viva Las Vegas.” He sang. Runners would stop and have their picture taken. We move on. Pass the 13.1 mile marker, the sun is already high already and I am slowly getting tired. At mile marker 15, I see the Novacare tent with Jamie waiting to cheer me on. It is a welcome sight to see her. She checks my ankle and asks how I am doing. In pain. “You look great!” She says. Yeah, right. Are we there yet? From there it is all work now. We work through Little Italy (mile 18), jog pass the mariachi band with their monstrous paper mache giants at Pilsen (mile 19), and saw the worn out dragon resting in Chinatown (mile 21). We lost Elizabeth. My wife and I are constantly making stops by now and our pace group is way ahead of us. My wife complaints about her plantar which is hurting but amazingly she does not give up. We don’t talk much anymore. I think she is afraid to show her pain for I will give it up for her. She sees me struggle with my step but I don’t give up either. But my legs are are cramping up and my sprained ankle is hurting. We get to the infamous ‘The Gap’, a lone stretch at mile 24, where few people cheer. This is torture and it is so tempting to give up. But I think about my chemo sessions and this is nothing. Then the crowds starts to thicken as you get closer. The last mile always seems the longest because you are in severe pain. There are more medical staff along the way, some on bicycles. My wife and I went for the last push and drag our aching legs up the bridge on Roosevelt Ave. I run near the crowd to feel their energy. I am almost there. I hate cancer! I hate chemo! Up the bridge, a left turn, and bam! 100 yards to the finish and a wall of people on both side cheering. I am hardly feeling my legs. I grab my wife’s hand. I imagine you there cheering me. Go Bo go. Don’t give up. And as I step across the finish line I felt complete. We finished, you and I, together in this journey. Thank you. Since the marathon, I have been recovering. The first few days were hard to walk. Many have sent me notes and text asking how I did. We beat Al Roker, LisaS. It is not my best time but a significant improvement from last year. Not bad for a runner with a sprained ankle. I am happy. Happy also is Amber Miller, a 6:25 finisher who gave birth to her second child, June, hours after finishing the marathon. (I beat the pregnant lady by five minutes…ha!) People debated about her decision to run close to her due date (see related story “Woman gives birth after running (and walking) marthon”). After the marathon, the next challenge is to face my cancer again. Those damm six nodules in my lungs. I can almost hear everybody in chorus: Bo, do your CT scan….please. I cannot run from this, can’t I? Note: I decided to break it in two parts for ease of read. 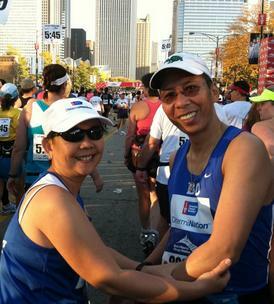 his is my third time to run the Chicago marathon and it still excites me to be at the starting line. Each marathon or race is different no matter how many times you have run it. On race day, October 9, it is a mild morning at 62F (16C) with an expected high of 82F (27C). It is going to be hot. But you can tell it is going to be a good day too. The lines to the toilet are shorter, the wind is steady, and the crowds will be thicker because of the mild weather. At the starting line, you see the veterans and the newbies with their own pre-race rituals. Some fidget or walk around, while others just sit, pray, or absorb all the surroundings. All came to find out what they are made of. Each has their own story. Mine is about living with cancer and the hope of becoming a survivor. But on marathon day that all take a back seat. It is about living, running (or a challenge), and the pain that goes with it. I think it can be said that your yearning for life is only limited to your willingness to accept pain and sacrifice. You become a different person. Like when I go through each of my chemo treatments I feel I am not the same person anymore. For me, running a marathon is like that too; it gives me a sense of rebirth. Let me tell you about it…. On Friday (October 7), my wife and I picked up our bibs. I was assigned 26009 and she was given 49105. Wow. Once I have my bib, it felt real. We browse some of the exhibits in the expo and bought the customary running shirt to mark the event. You can’t wear your bib everyday but a cool running shirt or dri-fit top is a must to show off even if you don’t finishing the race. At the expo, I managed to see Ryan Hall, the top-seeded (2:08) American born marathoner signing autographs. Go Ryan! Go USA! That Friday night, the American Cancer Society is hosting a team dinner for all their charity runners. My wife and I have been attending this for the past three years and we could not help but be amazed at how the program has grown. ACS will have 700 runners running in the marathon and we have raised almost a $1,000,000 in total. Thank you to those who have helped me. During the evening, four speakers shared their stories on how cancer have affected their lives through a family member, friend, or themselves. Listening to them, I related to all their heart-felt stories. One of them ended with a poem that goes like: I choose to run or do other wonderful things that life has to offer, but with cancer, it chose me. That’s me. Saturday brought me to the office of Novacare. Jamie, my PT, had volunteered to open up their office tape-up my ankle but instead Noreen (a cancer survivor still undergoing chemo) did the honors. Watch out Kenyans, I got my support crew patching me up. I love these guys. No more tears, Noreen.